Sound Proof Door Strip Weather Stripping Door Draft Stopper and Self-adhesive Door Window Seal Strip Rubber Weatherstrip in one kit, save your money and time.Weather stripping for doors block the clod and hot air cross,reduce electric and gas cost.under door draft blocker keep bugs off,under door noise stopper reduce sound mostly. 1) Sound Insulation,three layer design with this door draft seal, reduce sound mostly. 2) Keep bugs off,with this good seal door sweep,Bugs will not climb through the crack under the door. 3) Energy saving,this door weather stripping will block the cold and hot air cross,help you reduce electric and gas cost. 4) Easy Installation,fast and easy installation within 2 minutes using this door bottom seal weather stripping,high resilience and no damage to your floor. 5) Stronger stickiness,we thicker the glue layer 1 more mm, never worry about the weather stripping for doors will fall off. Step 1: Mark the same size as the door and cut the excess strip. Step 2: Clean up area of the door. Step 3: Tear off the baking red film. Step 4: Apply the strip to the area. 1) Make sure the door clean and dry before using the weather strip for doors. 2) Avoid exposing the glue part to the air for a long time or touching water,oil,dust. 3) After installation please be strength press the sound proof door seal to make it more firm. Provides 100% no questions asked money back guarantee. Quality Guarantee: Environmentally friendly silicone,non-toxic,best under door weather stripping for doors;Use thicken backing,strong adhesive,not afraid of the damp environment,such as bathroom,washing room and etc.Never worry about the door bottom seal strip will fall off. 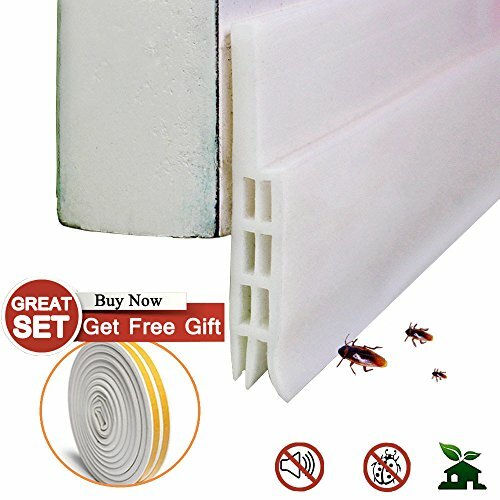 Say No To Pest,Noise And Cold Air: With soundproofing holes and 3 layers,The sound proof door strip could reduce sound up to 5 times.Block the cold and hot air cross,help you reduce electric and gas cost.Good seal of the under door sweep white prevent you from the pest,such as mouse and cockroach. Extreme Flexibility: All-in-one forming,smooth surface,not easy to be deformed while using,high resilience and no damage to your floor.The under door sweep sound proof can seal gap of 0 to 28mm. Easy installation：Fast and easy to install this door bottom weather striping within 2 minutes,no tools are required. If you have any questions about this product by CH HAICHENG, contact us by completing and submitting the form below. If you are looking for a specif part number, please include it with your message.